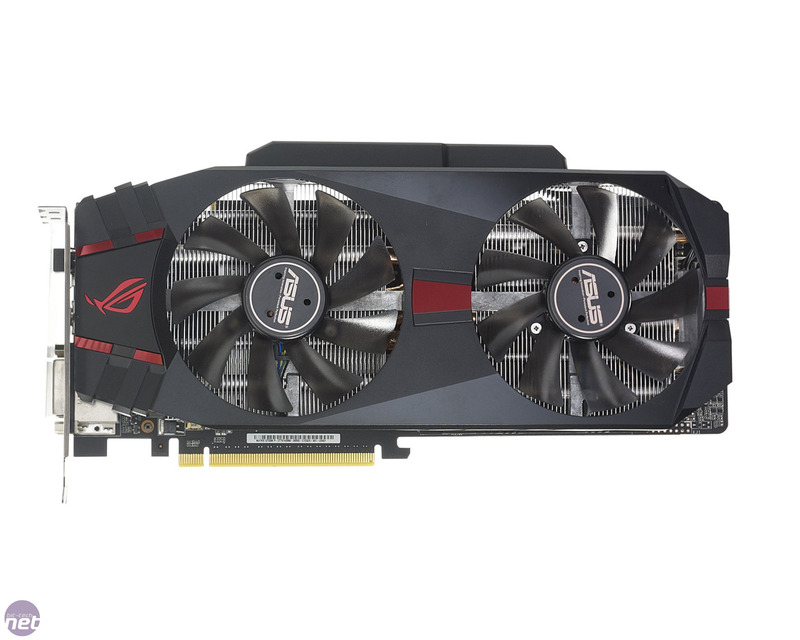 As the GeForce GTX 580 1.5GB is the fastest current GPU, plenty of graphics card manufacturers are offering heavily modified, super-fast versions. We’ve seen MSI’s N580GTX Lightning Xtreme Edition reach a GPU frequency of 980MHz, and now it’s Asus’ turn to show off with its Matrix GTX580 Platinum. The Matrix’s 285mm-long PCB crams in a bank of 18+1-phase VRMs, with 16 phases dedicated to powering the GPU and another two powering the card’s 1.5GB of GDDR5 memory. The phases are very tightly packed, with an NEC Tokin Proadlizer fitted to the rear of the GPU. The Proadlizer replaces the small silver capacitors used on cheaper cards to smooth signal noise and potentially improve overclocking abilities. Cladding the PCB is a huge triple-slot cooler, which is a part of Asus’ DirectCU II range. This means that the five copper heatpipes that run through the two heatsinks are flattened to form part of the GPU contact plate, resulting in more efficient heat transfer. Providing airflow through the network of cooling fins are two 90mm fans, which are protected by a plastic shroud that sports a nifty backlit Asus Matrix logo. The colour of the light also changes depending on the card’s GPU load; it glows red under 100 per cent load, then switches to purple and then to blue, before changing to green when idle. It provides a useful reference for how hard a game is pushing the card. The lightshow continues with a bank of LEDs at the right edge of the card, which are linked to a pair of voltage control buttons. These enable you to increase the GPU core and memory voltages by up to 12.5mV, in excess of any increases you might make in Asus’ overclocking software. 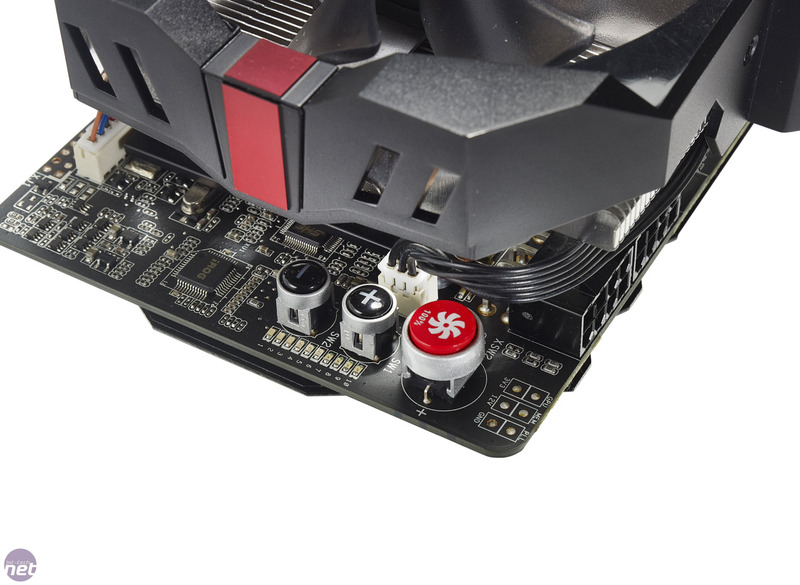 A backlit 100 per cent fan button is also fitted. Unlike the MSI N580GTX, the Matrix also sports the standard 1.5GB of GDDR5 memory. This is a little disappointing, as we’ve seen that extra memory makes a significant difference to performance at higher resolutions in some games. Despite the standard amount of memory, though, Asus has fitted the card with a smart-looking backplate. This is only for looks and protection rather than cooling, as it doesn’t make contact with the rear of the PCB. The Matrix’s factory overclock is fairly meagre too. The GPU core frequency of 816MHz is only a 5 per cent boost over the stock frequency of 772MHz, and the memory frequency remains at 1,002MHz (4,008MHz effective). Meanwhile, should your overclocking cause any issues, a Safe Mode button on the rear IO deploys a backup vBIOS, which restores the original clock speeds.